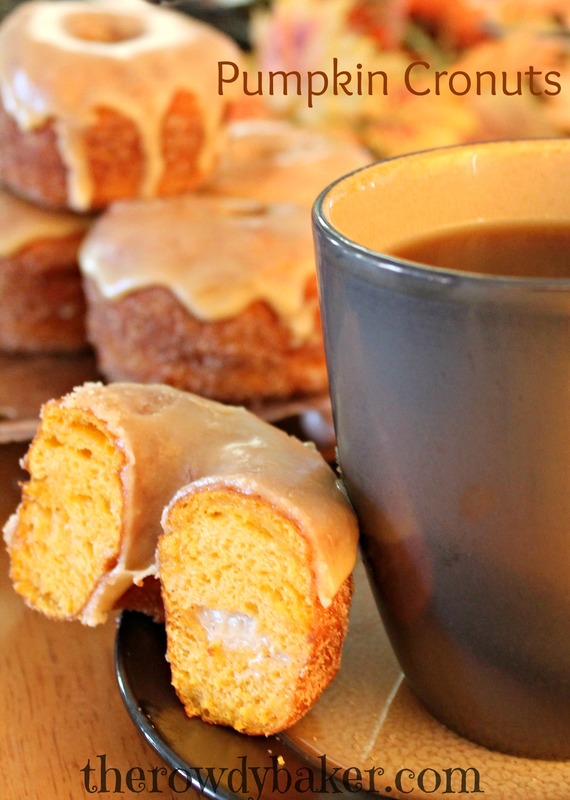 With cold weather comes comfort foods, and doughnuts are right at the top of my list…as are croissants. Since I’m also in the middle of my annual pumpkin frenzy, it only made sense to combine the three items to create a batch of Pumpkin Cronuts. I don’t want to scare you away, but I have to admit that these are a lot of work. The good news is, it can all be spread out over a couple of days, so there won’t be any last-minute panic at all. The goal is to fry the cronuts on the same day you plan to serve them, and a little careful planning will make this a slam dunk. On the day before you plan to serve them, begin making the dough. Don’t start this late in the evening – give yourself at least 4 hours. 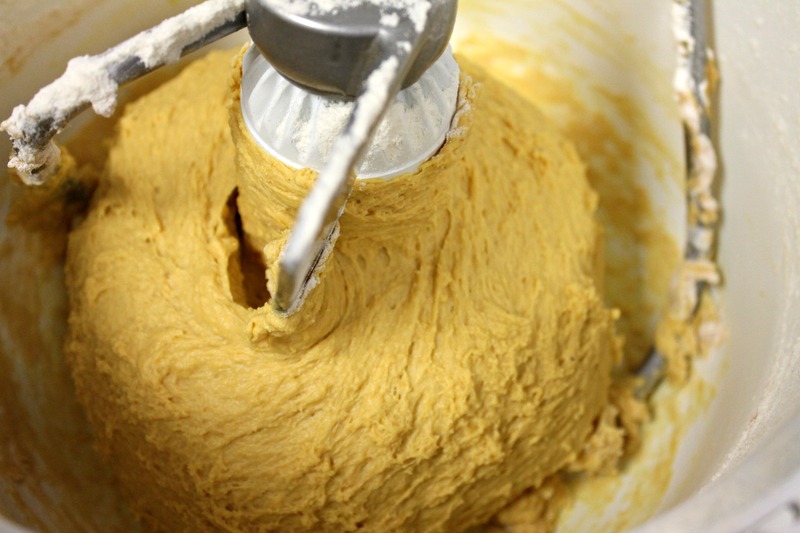 The dough is rolled and folded, then chilled. Rolled, folded, chilled. Repeat. It isn’t hard, honest. Every forty-five minutes you roll and fold…takes less than 5 minutes. Croissants require dedication and patience, but there is truly nothing difficult about them. I was worried about adding pumpkin to my dough, afraid it would ruin the flaky layers, but it worked very well. I made a few croissants out of the dough just out of curiosity, and though they weren’t quite as crispy as usual, there were no complaints from the menfolk, so I call that a win. 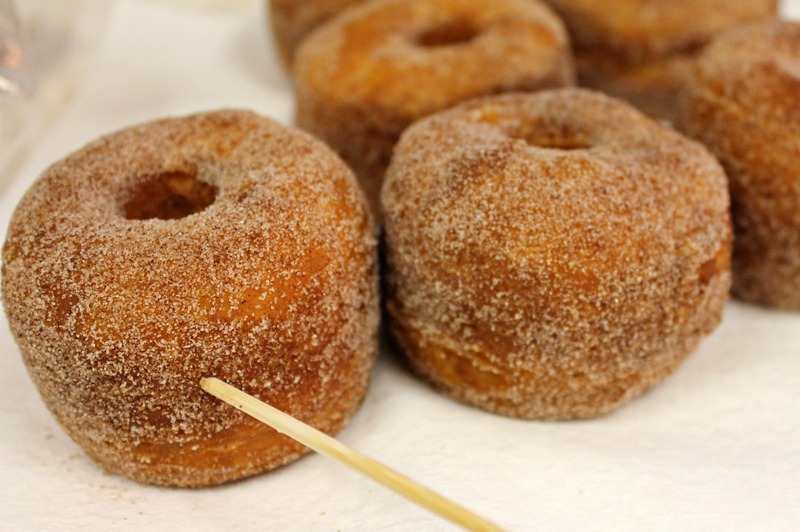 If you do nothing but make the cronuts and roll them in cinnamon sugar, you’ll probably still be thrilled with them. As far as I’m concerned, the filling and icing are optional. Personally, I prefer them without filling, but I get outvoted. Don’t be afraid to customize these goodies. If you don’t like pastry cream, fill the cronuts with pudding – or even whipped cream, if they will be served promptly. For a lighter icing (my recipe is rich and buttery) try dipping the tops in melted white chocolate, or use a simple milk/powdered sugar glaze. Or…leave them plain! 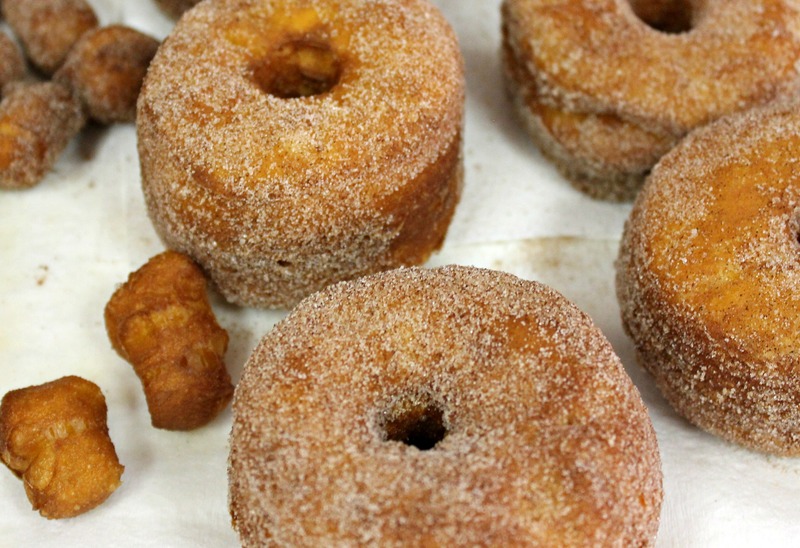 Pumpkin Cronuts without filling or icing…just cinnamon sugar. 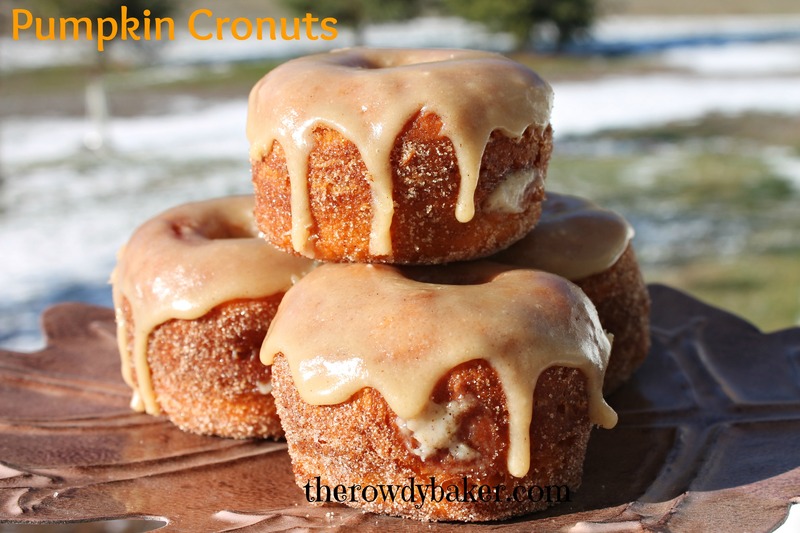 The important part of this post is the cronut recipe itself, and since I can only create one printable recipe per post, I’ll add the filling and icing recipes below. Makes 12-15 pastries, depending on the size of your cutter. And lots of yummy "cronut holes". In a large bowl (a stand mixer works best), combine the warm milk and yeast. Allow the mixture to sit for 10 minutes. Mix in the pumpkin, 1 tablespoon butter, vanilla, sugar, salt, and 2 cups of the flour. Beat well. Cover and allow the dough to rise in a warm place until double - about 1 hour. Punch down dough. On a lightly floured surface, knead the dough a few times, pat it into a rectangular shape, and place the dough in a heavy plastic zipper bag (or wrap in plastic) and place in the refrigerator. Remove the 2 sticks of butter from the refrigerator. Working with one stick at a time, place it between two sheets of parchment paper and roll it out to 6½ inches by 4 inches. 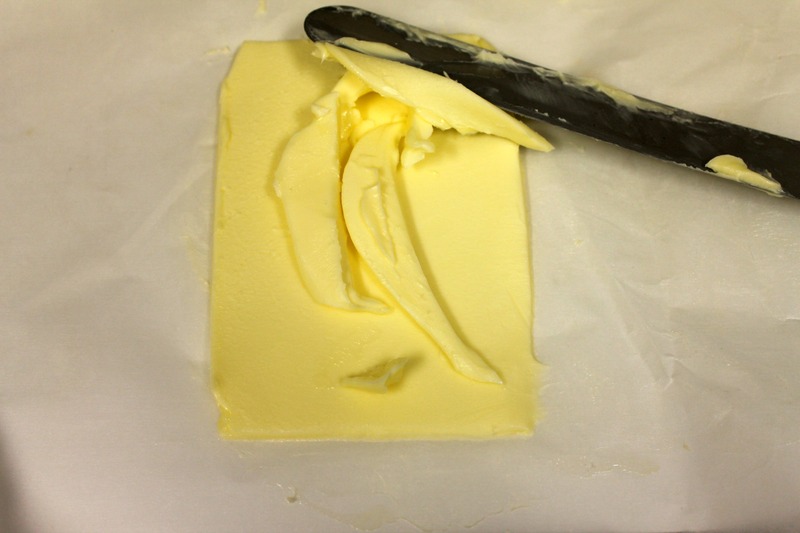 To get straight edges you will need to trim the sides with a spatula or knife, spreading the excess back over the butter as you go. Don't worry - just trim it and smoosh it where it needs to go! Wrap each piece in parchment and put them back in the refrigerator to chill for ½ hour. When the butter has chilled, remove the dough (hang on to that bag...you'll need it again) and roll the dough out to 12 inches by 8 inches, with the long side facing you. Place one piece of chilled butter directly in the center, with the short side facing you.Fold the right side of the dough over the butter and press the dough around it gently. 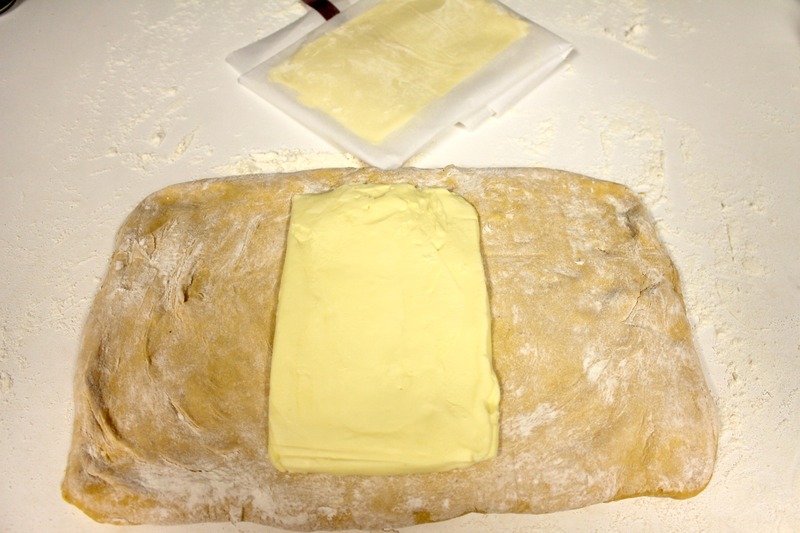 Place the other piece of chilled butter on the dough directly above the other piece of butter. Fold the left side of the dough over the top of the butter and press and pinch the dough all the way around to seal it. 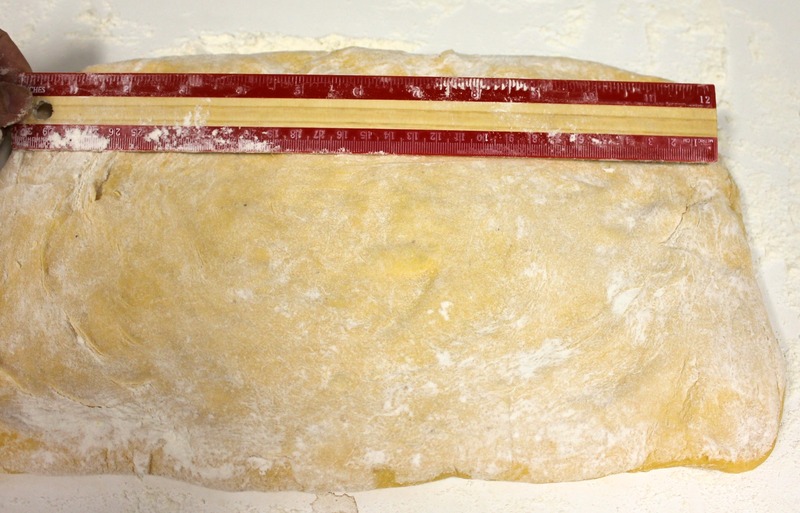 Gently roll the dough out to measure 12 inches by 8 inches with the long side facing you. Fold the right side over one third, and the left side over the right side. The open edge should be on the right, like a book. Put the dough back in the bag and place in the refrigerator for 45 minutes. After 45 minutes, remove the dough. Roll dough out to measure 12 inches by 8 inches, with the long side facing you. Fold the right side over one third, and the left side over the right side. Return to the bag and place in the refrigerator for 45 minutes. Remove the dough from the refrigerator. Roll dough to measure 12 inches by 8 inches, with the long side facing you. Fold the right side over one third, and the left side over the right side. 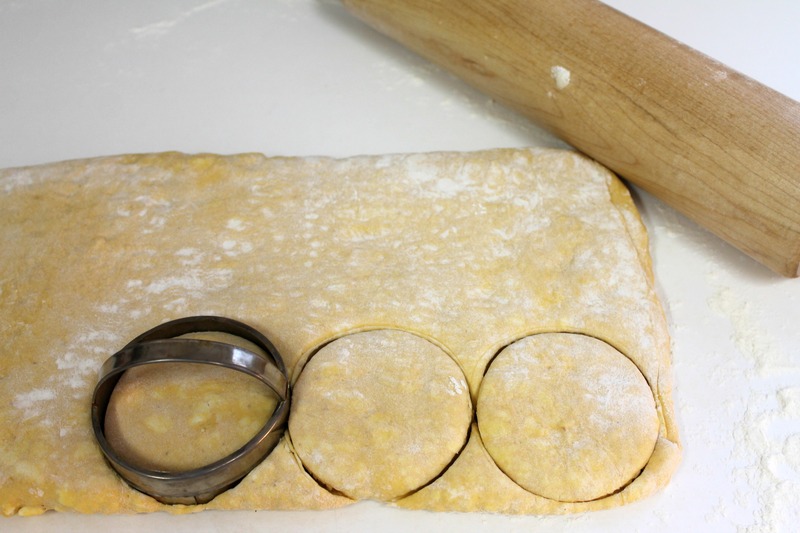 Roll dough out to measure about ½-inch thick. (3/4-inch if you want very tall cronuts.) 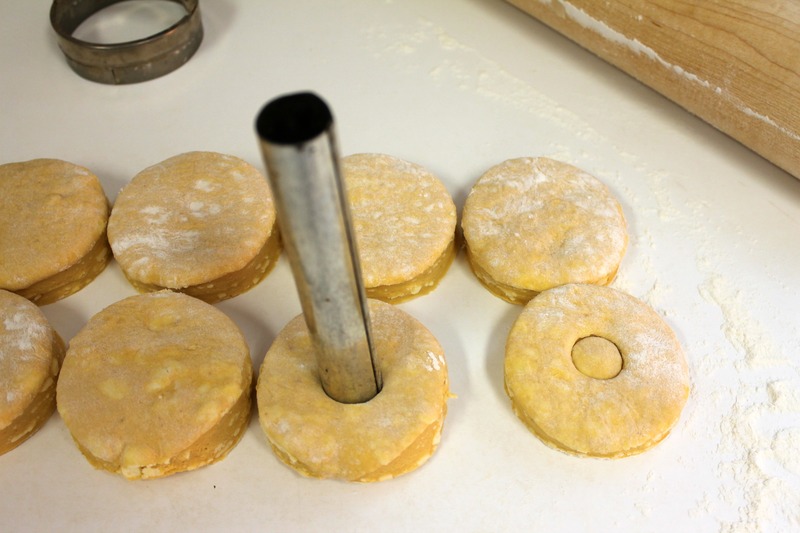 Cut with a round biscuit cutter, being careful not to twist the cutter. Cut straight down and lift straight up. If you have a doughnut cutter, use that! Otherwise, cut the center out with a the cap from a soda bottle or a cannoli form. (The centers make delicious "cronut holes".) Keep the shapes as close together as possible, because any cronuts made with re-rolled dough will be a little lopsided and won't rise as well. Cover the cronuts with a light towel and allow them to rise for at least an hour. They won't double, but you should see a difference. 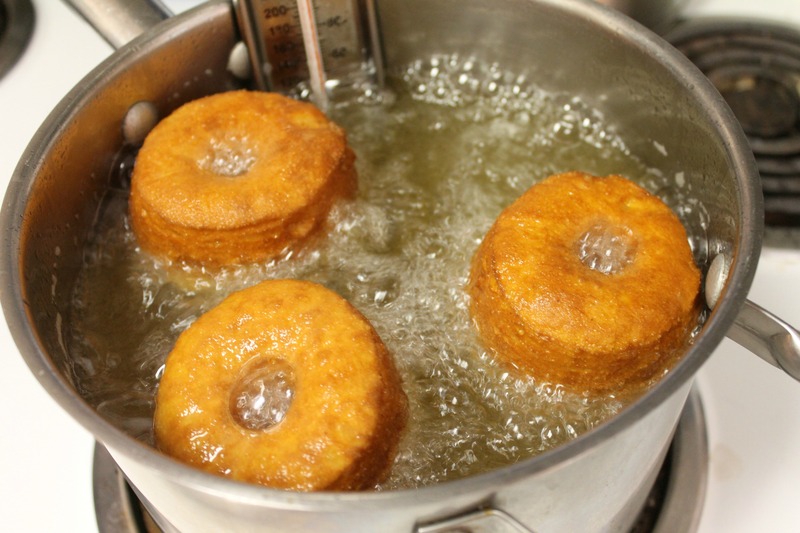 In a large, tall saucepan, heat approximately 3 inches of oil over medium-high heat until it reaches 370 F. Drop a few cronuts in at a time, giving them plenty of room to move around. Cook for about 1 minute on each side, until a rich golden brown. Remove from oil and place on paper towels to drain. 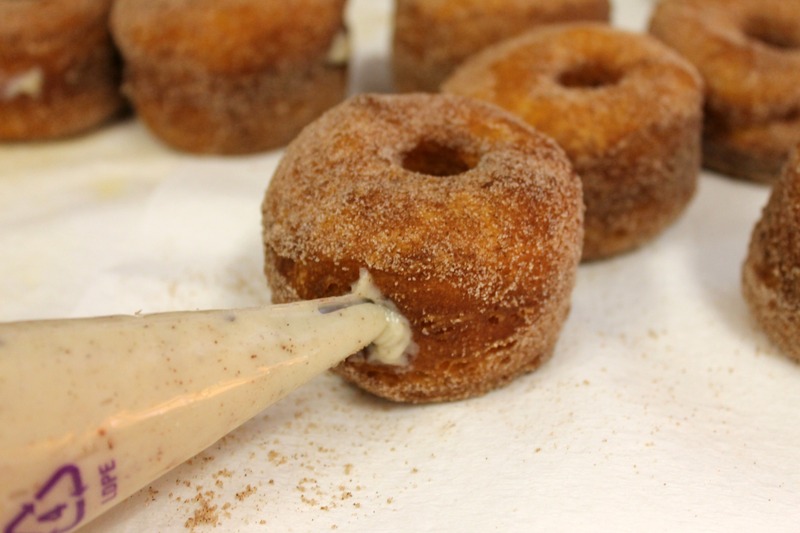 While the next batch is cooking, roll the warm cronuts in cinnamon sugar. Watch the temperature of your oil closely, as it can change quickly. You may have to adjust the heat or remove the pan from the burner briefly if it gets too hot. If your oil is too cool the cronuts will soak up the oil and be greasy. If it is too hot, the outside will cook and the inside will be doughy. 160-170 F works perfectly. Once all of the cronuts are cooled, poke two holes with a wooden skewer or chopstick on opposite sides of the pastry, half way up the side. Guide the skewer to the left and the right without poking through, and then pipe pastry cream into each hole with a pastry bag and bismark tip or medium round tube tip, pointing it left and then right and repeating on the opposite side. Once filled, dip the top in icing, glaze or melted white chocolate if desired. See this dough? Too sticky! Add a little more flour. Trim the butter to size. Spread the trimmings evenly over the top. Roll and measure the dough. Place one piece of butter in center of dough. 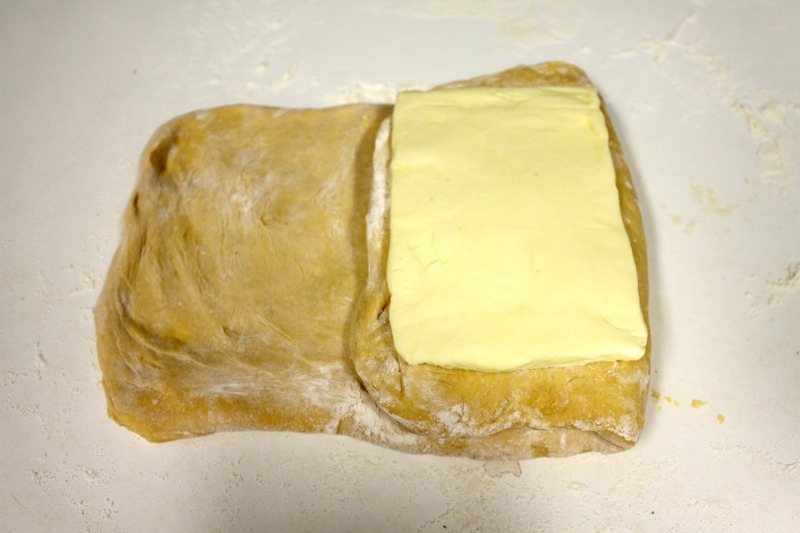 Fold right side over and cover with 2nd piece of butter. 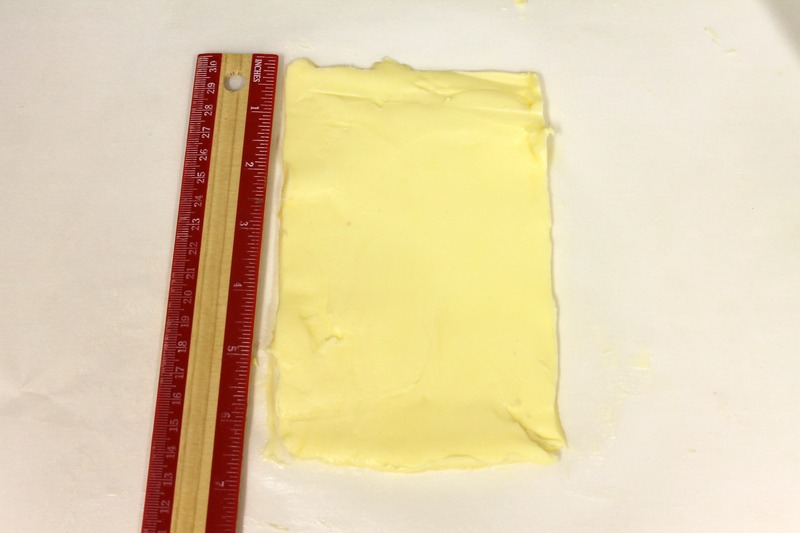 Then fold left over butter and seal. Poking a channel for the filling to follow. In a small bowl, whisk together the cornstarch, sugar, water, and egg yolks. Set aside. In a small saucepan over medium heat, bring the half & half to a simmer. It should be hot and bubbly, but not boiling. Pour half of the hot half & half into the bowl with the cornstarch mixture, whisking well. Pour the mixture in the bowl back into the pan, whisking. 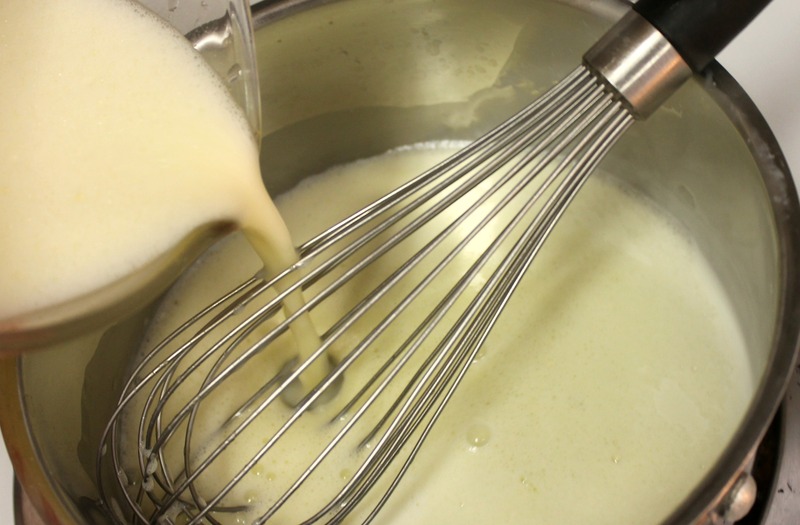 Whisking continuously, continue to cook the pastry cream until it thickens – approximately 2 minutes. 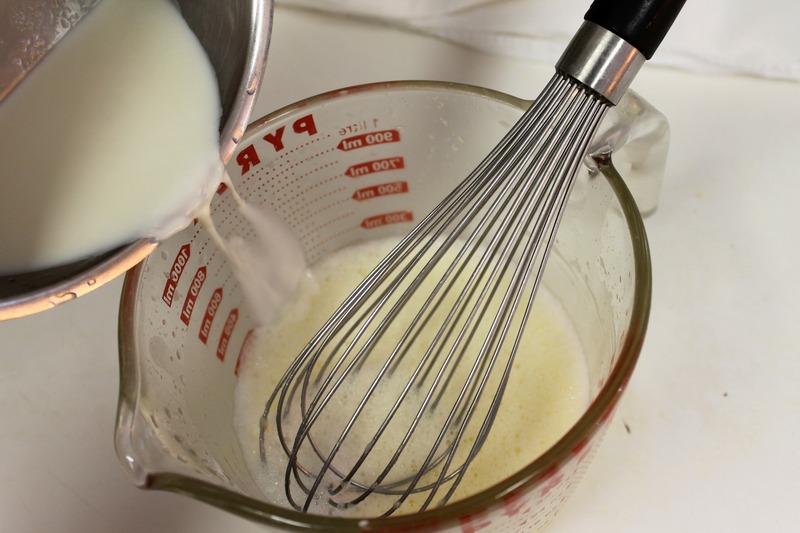 Whisk briskly to remove any lumps, and remove from the heat. Stir in vanilla and pumpkin pie spice. Cover and allow to cool, stirring occasionally. If you are making the cream ahead, keep refrigerated until ready to use. If the cream is too thick to pipe into the cronuts, try whisking it briefly. If necessary, add a small amount of milk. …then return it to the pan and whisk away! In a medium saucepan over medium heat, bring the brown sugar, white sugar, milk, and butter to a boil, stirring constantly. Cook at a low boil for 2 minutes. Remove from heat and add vanilla, powdered sugar, and chocolate chips. Whisk vigorously until smooth. Adjust to dipping consistency by adding additional milk or powdered sugar, if necessary. May be reheated slowly. So…have I scared you off? I know it may look overwhelming, but if you just take the directions one step at a time you can DO this! I have the shortest attention span in the whole world and I can do it…and so can you. Don’t be shy! Please leave me a photo of your masterpieces; I’d love to see them!